Travelling to Scandinavia is not a big problem. Just go to the nearest station, enter a train. Or take the car to the sea and enter Scandinavia by ferry. However you can even the airplane! When I was a 6 year old boy I visited Scandinavia (Sweden) with my parents for the first time. We did camping and went by car and ferry. 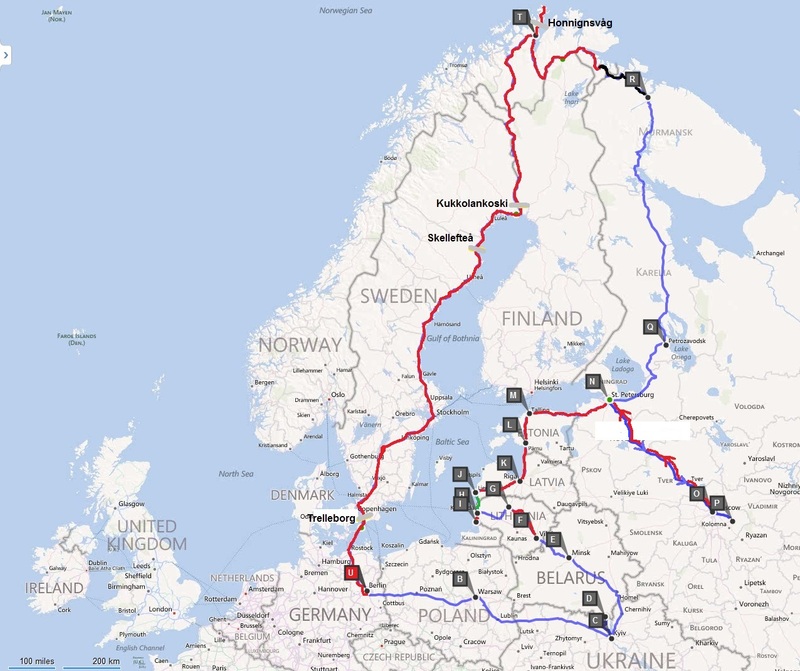 Of course I took a glance on the map and saw the connection between Russia and Scandinavia, so we didn’t had to use the ferry! The idea of going to Sweden again, but over land via Russia was born. Of course my parents weren’t fond of this idea at that time. After my trip to Iran in 2011 I decided to face the journey in summer 2012. I was on the road for 50 days – from 13th July till 1st September -, covered a distance of about 10.800 km, half of them by hitch-hiking, and spent about 1100€. Apart from two nights spent in hostels (Riga, Tallinn), 4 nights in my tent (Dobele, Pärnu, Honningsvåg and Kukkolankoski), 2 nights in a train (Warsaw-Kyiv, Petrozavodsk-Murmansk) and some without sleeping at all, I used couchsurfing. A huge THANK YOU, TACK and СПАСИБО to all of my couchsurfing hosts and those I met because of couchsurfing or hitch-hiking or just on the route !!! If you liked my travel blog I’d be happy if you tell your friends or share it on social networks. This blog won’t receive any more posts. So of course you can follow it, but you won’t get any notifications. I want to apologize for any mistakes I made. If you find any, it’ll be nice if you let me know.